Coventry winger Andy Bulumakau intercepted a flat pass to kick-start the proceedings when he dotted down in the 7th minute and fly-half Will Maisey converted it to provide early lead of 0-7. The scores were levelled by the 13th minute when Harry Elrington dotted down and was followed by a conversion from Jacob Atkins. The Exiles had the momentum on their side and soon doubled their tally by the 19th minute with skipper Barney Maddison diving over the line that was improved by Atkins. As the half-time was approaching an infringement from Coventry allowed Atkins to kick a penalty as the teams went into the break with a 17-7 scoreline. Like the first half, Coventry were the first to get off the block in the second as well with Will Maisey kicking a 53rd minute penalty to reduce the gap to seven points but seven minutes later brilliance from Ben Loader as he breached the visitors' defence proved pivotal in London Irish getting their third try that stretched the scoreline to 24-10. With five minute left in the game, Ben Nutley provided Coventry hope with his swift try and a conversion from Maisey reduced their trail to seven points. 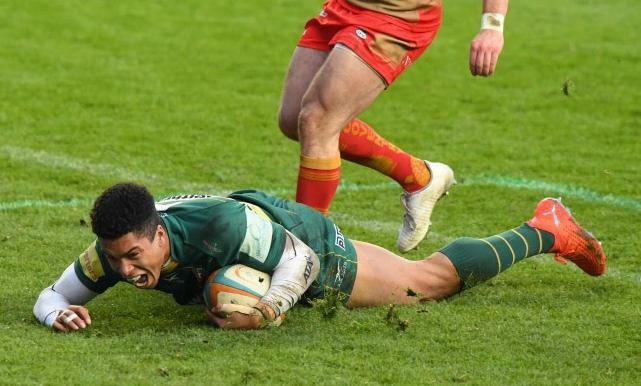 As the game was nearing the closing stage, Atkins held his nerve to kick the final penalty goal as London Irish completed a 27-17 victory.